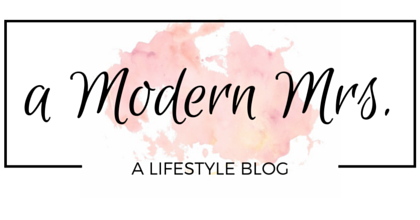 NUK Learner Cup Review — a Modern Mrs.
E is a breastfed baby. She rarely ever got a bottle, because she rarely ever needed one, but she would drink from one when offered. That said, once she got a bit older, we did introduce a sippy cup. We didn't really push it for a while, but we did give it to her on occasion and try to encourage her to drink from one. Well, as she got closer to a year old, I tried to push the sippy cup a little more, and she never would drink from it. She'd mostly just play with it, chew on it, etc. I figured maybe it was that particular cup, and I purchased something else. So, I purchased something else. Then a different cup. 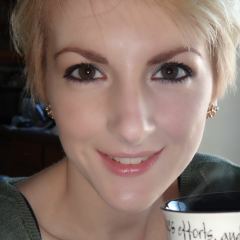 And another, different cup. I even tried regular kids cups with a straw, because I thought maybe she had problems getting the liquid out of the cup. Fast-forward to one particular day as I was browsing Walmart's baby section, and I happened across an end cap display with NUK's Learner Cups. 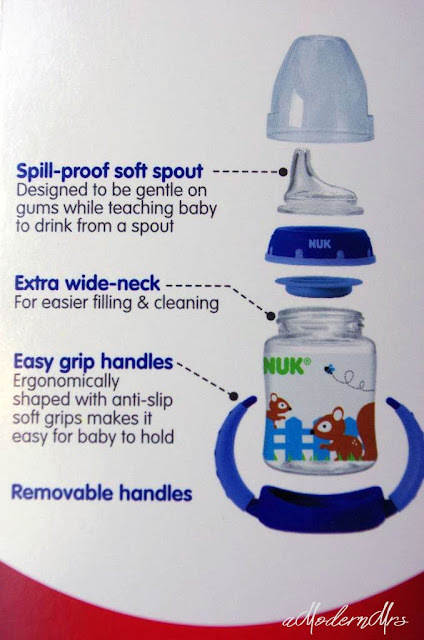 I thought, "Now wait a minute..." You see, NUK's Learner Cups feature a soft, silicone spout — very similar to that of a bottle, which Elise (remember?) would drink from when offered. I figured this was the last straw. (No pun intended.) If this cup didn't work, nothing would, and my child would be stuck until she could manage a traditional cup. Color me surprised, folks, because on the first try... she actually drank from it! Whoa! What's even better is because of this cup, she will now drink from the massive stock of various sippy cups I previously purchased, so I didn't actually waste my money (like I had thought)! /cheers! NUK's Leaner Cups come in a wide variety of designs, ranging from non-themed to themed, with characters like Hello Kitty, Winnie the Pooh, Mickey Mouse, and more. 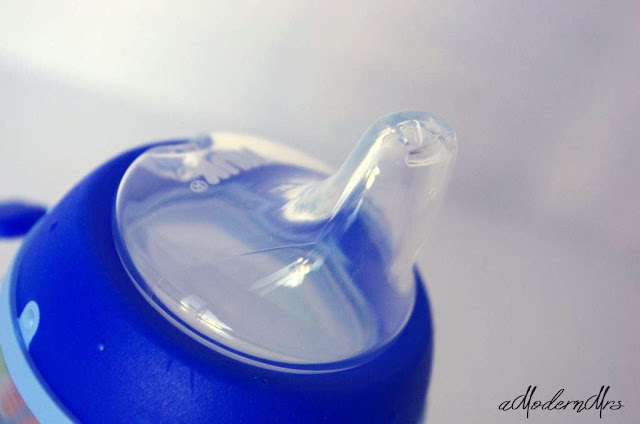 They feature the soft spout, are spill-proof (yep... the left on the floor, tipped on its side, full of beverage, and not leaking on the floor spill-proof-type), and have a removable handle with a soft, comfortable texture. All pieces come apart easily to allow for a thorough cleaning, which I especially appreciate, because E can get food mess crammed into the strangest of places. She really is remarkable to that effect. I would also like to add the soft spout is pretty durable. E recently has taken to biting down on it, and pulling it out of her mouth.... and out from between her teeth. We haven't had any tears yet! NUK's Learner Cup has a nice flow, too. I can hear E sucking water down easily, but not so much that she chokes. We have had such success with this cup that I went and purchased more! 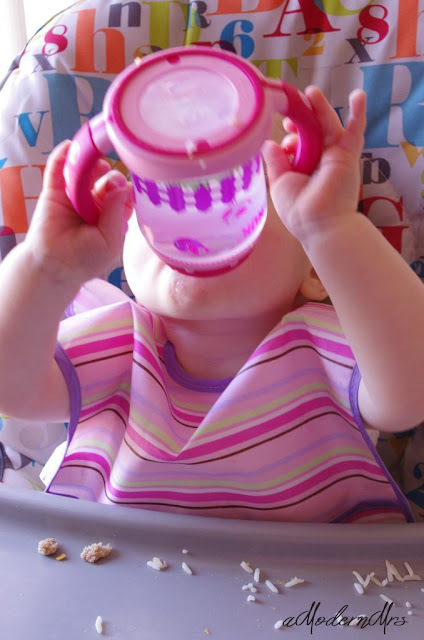 While she is using her other sippy cups, NUK's Learner Cup is definitely her preferred cup, and I like having extras so I don't have to wear one out washing it constantly. 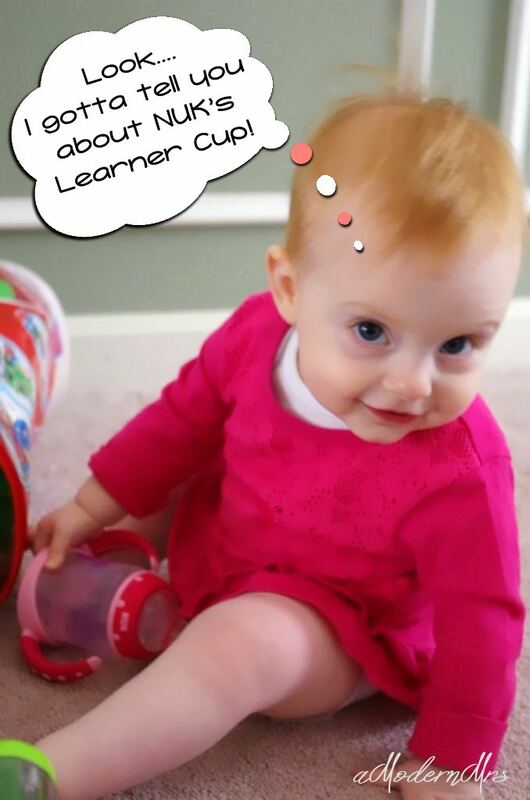 While E is 13-months-old, we are still using the 6+ month version of the Learner Cup, simply because she was struggling so much. It also helps that it's smaller, since she isn't drinking as much as frequently, as she still nurses regularly throughout the day. For those of you who need/would prefer a cup that accommodates more beverage, I would recommend NUK's 10 oz. Learner Cup, or their Active Cup. 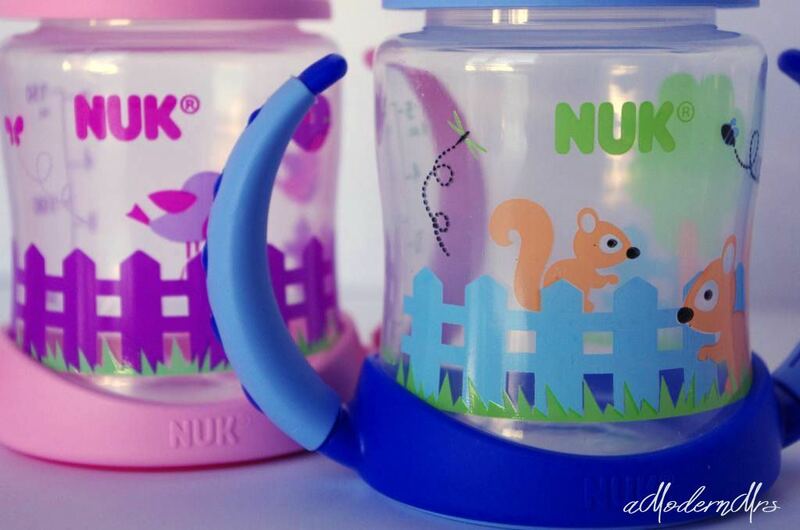 NUK's Learner Cups are BPA-free, and dishwasher-safe (top rack, please), and retail for around $7.99 a piece. 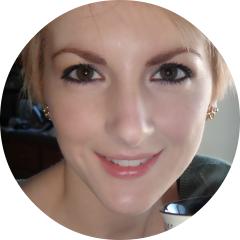 They can be found at Amazon.com, Target, Walmart, and most grocery stores. However, NUK has a $1.00 off coupon on their website, so be sure to grab that before you make your purchase! I can't rave enough about NUK's Learner Cups, folks. They really were a game changer for us, and helped E to start actually drinking from sippy cups, rather than just play with them. 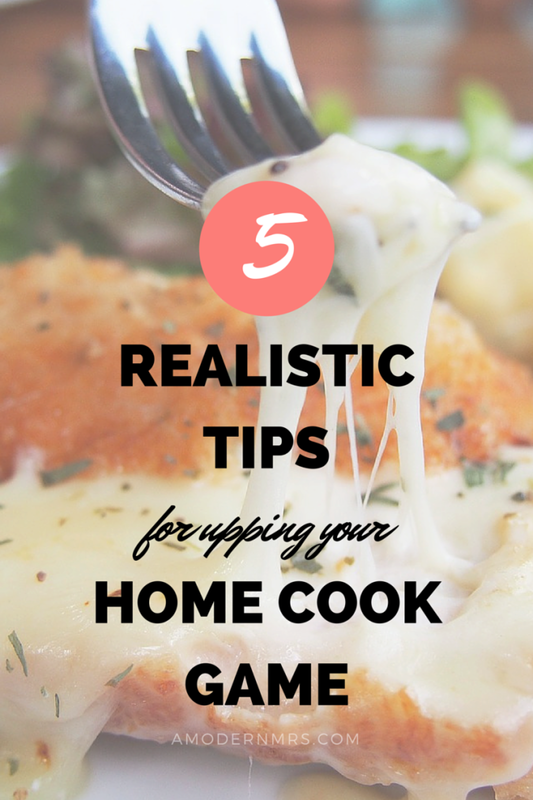 I love how cute, yet functional they are, and I'm happy to have another wonderful NUK product in our home! Is your little one ready for a sippy cup? 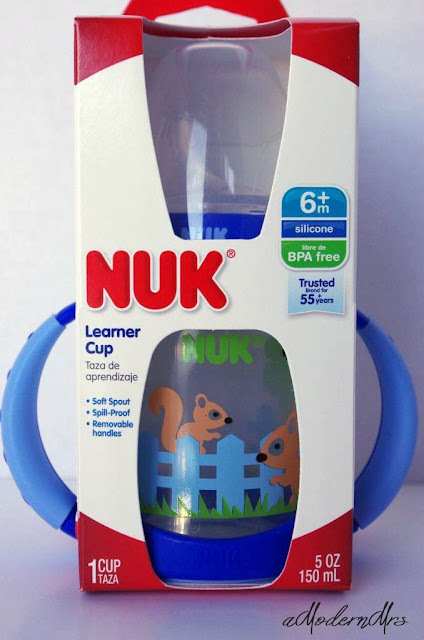 Will you try a NUK Learner Cup?